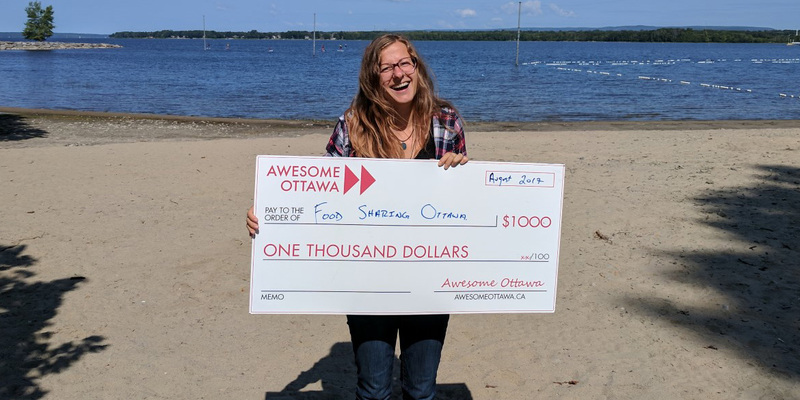 August’s Awesome Ottawa award goes to Carolin Ross to fight food waste through Foodsharing Ottawa. Foodsharing Ottawa will use the award from Awesome Ottawa on marketing materials. “We want to draw more attention and spread the word,” says Carolin. “The more people involved, the more food we can rescue and the more we can give back to our community.” She hopes to save another 50,000 lbs of food over the next year. Want to get involved? Visit Foodsharing Ottawa’s website to volunteer or become a cooperating business, or check the group out on Facebook or Twitter. Carolin grew up in Germany and moved to Ottawa two years ago, after working and travelling in Australia, New Zealand, and Scotland. She works at a start-up and lives with her husband and two dogs in Britannia.